Hope can come in many forms, but this puppy just might be the cutest. Rescue crews scouring the ruins left behind after last week's massive warehouse explosion Tianjin, China, were surprised to find a sign of life amid so much devastation. Incredibly, more than three days after the incident that claimed dozens of lives, they found a tiny puppy still alive and well - and miraculously unhurt within the scorched blast zone. 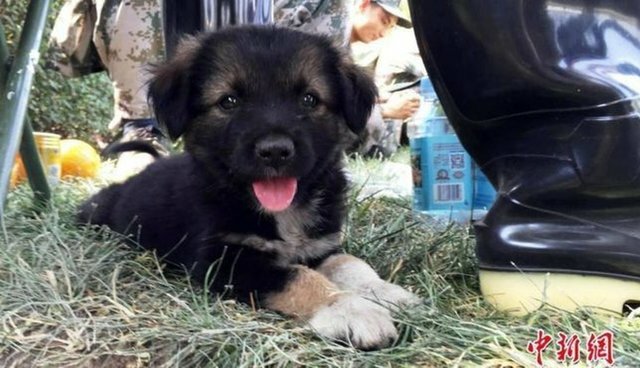 It's unclear how the puppy escaped the explosion without injury, but word of the incredible little survivor spread quickly on Chinese social media. There his rescue is being celebrated as a rare bit of good news in light of recent events. "We have been reading so many stories of death and loss, especially our young firefighters. So I am glad to hear how a tiny puppy has become a story of strength and kindness in China today," wrote Yang Yi Chang on the site Weibo, as quoted by BBC. "The puppy wouldn't even leave its rescuers, such loyalty."